Tonight an extremely dear friend of mine texted me, overwhelmed with the emotion she was experiencing at her firstborn’s impending first day of kindergarten. I remember, quite clearly, having experienced my own meltdown(s). Definitely plural. MY firstborn, my beautiful, smart, hilarious and sweet boy, just completed HIS first year of kindergarten. Knowing now that I’m not the only mommy who felt the way I did – and BOY did I let Mommy Guilt think I was alone – I thought I’d share some of my thoughts, both leading up to and from the other side of the big event. 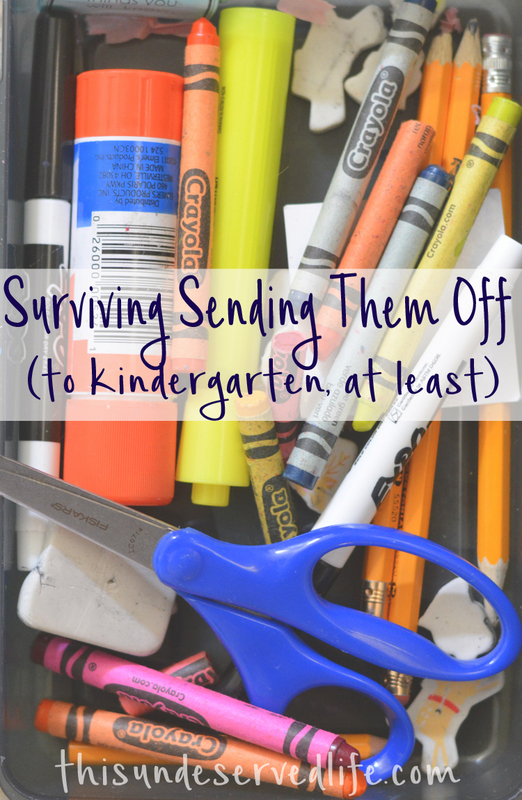 Once he graduated from preschool (yes, it’s a thing, and yes, it’s cute), I suddenly felt unprepared. My sweet little guy who had up until now lived pretty wholly in clothes from Children’s Place or consignment stores, was now going to be wearing uniforms. Polos. He was going from elastic-waist shorts to flat front khakis. The school wanted him to dress like a dad or a car salesman. For three months before the big First Day, I scoured the internet like a mad woman. I was determined to discover the trends among 5-year-olds and deck my boy out in the coolest duds. Because of the uniforms, the shoes, backpack, and lunchbox REALLY had to pop. I’m embarassed to admit that I even asked a few friends what their kids thought was cool. I came THISCLOSE to buying my 5-year-old son a $45 lunch box. Seriously. I was convinced that if he sat down at the lunch table with this lunch box (it was EPIC), he would have all the confidence in the world that he was the coolest kid alive. Other children would flock to him like the cafeteria style guru he obviously was. They would decide right then and there to vote him prom king, and the salutatorian would mention this lunchbox in his or her graduation speech when referring to the valedictorian, my son. Heck this thing was going to get a quarter page on his college applications. Fortunately, my husband is much more grounded than I. He thinks realistically and reels me in, reminds me of the true size of our bank account. God bless him. So then I was filled with guilt. Guilt that I could not afford $45 for a life-altering lunchbox. That I couldn’t buy him the coolest things ever to give him kindergarten swagger. That his uniform polos wouldn’t be Tommy Hilfiger or Big Dog. Then I got REALLY sad when I realized that not only are Tommy Hilfiger and Big Dog polos NOT super cool anymore, he doesn’t even know what they are. So I moped about, poor and old, completely caught up in comparing my son to the imagined desiger-clad kiddos he would be sitting amongst all too soon. Then one night, while texting this same dear friend now that I think about it, I was standing in a grocery store at midnight, and it hit me. Or rather, the voice of God spoke to my spirit. All this energy that I was putting into making sure he fit in, and I had yet to even pray about him standing apart. Sure, no one wants weinie kids who get teased and bullied. But I had been so focused on his future popularity that I had completely neglected his future influence. Now I REALLY felt guilty. My tiny little preemie was no more. He was now tall and skinny and funny and smart and he ran like he was being electrocuted at the same time. He had opinions, likes, dislikes, hopes, fears, talents. More than anything, he had, he HAS, a purpose. And his first day of kindergarten was only going to be the beginning. So now that we’ve made it through that day, throught he first year, allow me to share my survivor’s knowledge. Kindergarten is not the end. Of anything. Regardless of the laws of logic, the beginning of one journey does not signify the end of another. In the weeks leading up to his first day, I mourned the loss of him. I looked back during my time with him as though it were pearls before swine, wasted, squandered, unappreciated. The saying is that hindsight is 20/20, but I don’t believe that. Because I was looking back in sadness, when I should have been looking back in pride. Pride at how far he’d come, from an incubator to a booster seat. He learned so much – to walk, to run, to speak, to use the potty, to FINALLY wipe himself, to tie his shoes, to eat with utensils, his alphabet, his numbers…. He was not the same boy I was first handed 5 years and 10 months ago. I should have been looking back with joy. Joy at the memories we’d made, the laughs we’d shared, the inside jokes we had, the places we’d been, the pictures we’d taken. I should have been looking back in amazement. I should have been looking back with satisfaction, an emotion no mother ever allows herself to feel when evaluating her job. When he came home from that first day of kindergarten, do you know what changed? Nothing. He was still the same boy. Still silly. Still sweet. Still so almost-alarmingly skinny. He was still MINE. Starting kindergarten did not put an end to our snuggles, or our jokes, or our memories, or HIM. I dwelt on every time I’d lost my temper or allowed myself to get annoyed by a preschooler, but in all of his About Me projects, he never listed one of those memories. Kindergarten is HARD. Not necessarily academically, but physically. My precious angel kept coming home as a GRUMPUS. He was exhausted! A sweet friend commented that it wasn’t him acting that way, it was kindergarten wearing him out that was acting that way. It took a few weeks to adjust, but his little body was soon able to handle the full day of fun and memories and learning and friends and normal-lunchbox lunches. Be prepared for tears and attitudes and extend some grace. You’re emotional, your kiddo is tired… just rest with each other until you’re used to it. Remember, you’ve been through kindergarten, but she hasn’t. Err on the side of patience and you’ll all be happier for it. You probably won’t love their teacher. At least, not at first. Who was this woman who spent more hours in a day with my child than I did?! How DARE she know things about him? The NERVE to have him sign the Sad Book for talking when he wasn’t supposed to! I cannot believe he hasn’t been given chemistry assignments already to stimulate his obviously-advanced brain! Yeah. Okay, Jen. By the end of the year, I realized that his teacher was actually wonderful, quite nice, and funny. I couldn’t imagine anyone being worthy of my son’s time and intellect, but she proved to me that she was. I salute all kindergarten teachers who experience this year after year, first-year parents so unsure of your abilities, jealous of your time. I imagine it’s how a mother feels when her son wants to marry – how could SHE possibly compare to ME?! Well, she doesn’t. She’s his teacher, and she’s wonderful, and she cared about my boy and taught him so VERY much more than I could have. But he still comes to me when he’s sad, or hurt, or sick, or hungry, or scared, or just wants some Mommy time. I’ll always be Mommy, whether he’s walking down the halls of school or the aisle of a church. That never ends. Read “The Kissing Hand”. And let it JACK. YOU. UP. Other kindergarteners attend kindergarten. I don’t know why, but I had convinced myself (and we all know how logically I think at this point) that the children my son would be attending class with would have the personalities of teenagers. They’d be judgemental and snarky and sexually active and rich. I thought my son was going to be in an episode of Gossip Girl, apparently. But you know what? There were – gasp! – 5-year-olds in there! A whole room full! They picked their noses and couldn’t tie their shoes and spoke with speech impediments and drank out of juice boxes. They had food smeared on their faces and couldn’t figure out their belts in the bathroom. A few hadn’t yet mastered wiping themselves. I know a few wet themselves at some point in the year. And from speaking with my sister-in-law, a kindergarten teacher, this is NORMAL. Kindergarten is a melting pot of developmental milestones. Some kids know their ABC’s, but not all. Some kids went to pre-k, but not all. Some have legible handwriting, but not all. Some kids wear velcro shoes, but not all. They’re KIDS. All of my fears at my son being bullied for being tall and skinny or not watching certain TV shows or being interested in engineering and architecture were completely unfounded. He made friends. They talked about Legos and ninjas and farts. There were no scandals, no betrayals, no broken hearts. No comparisons of abilities. They were KIDS, and all of the fears I had over perceived “faults” in my child were absolutely unfounded. They were all at kindergarten for their first day, too. You didn’t miss your chance. I don’t know why, but the most persistent thought I kept having in the days leading up to my boy’s big day was that I’d missed my chance. This goes hand-in-hand with the idea that something was ending. I still get to teach him values and morals and the lyrics to awesome 90’s songs. He still comes home every day. I’m still in the process of helping to mold him and guide him and encourage. My job is NOT over. As guilty as I felt at how annoyed I would get on some days, I still get annoyed. Not because I don’t love him, but because I’m tired. I go to bed nearly every night wishing I’d done the day differently with my kids. But, God willing, I get another day. And another. I get several chances at days and several chances to get it right. I can go to the class parties, go on the field trips, engage in the projects. I can pick him up from school and really listen as he tells me all about his day. I can write little notes and draw little doodles on his lunch napkin. I can surprise him with book fair money. I can bring him his favorite meal and eat with him in the cafeteria. I can get involved in reading programs and art contests and special event nights and PTO. I am still allowed to be a part of my child’s life! Kindergarten did not nullify that privilege. I have a feeling puberty will try to, but I’m pretty stubborn and prepared to put up a good fight. You don’t get points for Mommy Guilt. Really. Also, there’s no point system. If you can’t make it to the field trips, you’re still a great mom. If someone else picks up your kids after school, you’re still a great mom. If you’re working and can’t attend the Valentine’s Day party, it will be okay… and you’re still a great mom. If you buy Roseart supplies and your kid buys their lunch, if someone else’s mom hand-made personalized gifts for the teacher and you forgot to turn in a project, if you get a phone call from the school, if your kid needs help, you are still a great mom. Your child will graduate school without ever needing you to compare yourself to another parent, so don’t get into the trap of starting it now. I love my firstborn. I marvel at his eyelashes, his smile, his almost cartoonish proportions (Seriously, he’s super tall and skinny), his thoughts, his creativity, the way his brain works. He looks just like me, just like my dad. He has so many of my personality traits, but he’s incredibly also his own person, completely unique, never to be created again. I remember what the NICU smelled like when I rocked him, and what it felt like when they wouldn’t let me. I remember him turning in my belly. I remember how excited I was to see my first stretch mark (about that hindsight not being 20/20 remark….). He blows me away with the Lego creations he constructs. He amazes me at his ability to pick almost anything up in just a few moments’ time. He is a blessing and a miracle and an incredible gift. And even after sending that huge piece of my heart off to school, I survived. I still have those memories. And I get to make new ones. I’ll always remember his green polo shirt, how he sat down at his desk and just started working, then asked me why I was still there. In just a few weeks, I’ll get to make the memory of his first day of first grade. We can only make more memories from here on. I’m in no rush to get there, but I know I’ll make it. I know I didn’t waste the 5 years and 10 months I had with him, because I’ve had so much more than that. I know I didn’t completely blow it, didn’t waste it. I know he’s a big boy, but not too big. I know he’s coming home with me, and he knows I’ll be there to pick him up. He’ll be at school, making friends and memories and projects, learning from a caring and capable teacher. And no one will ever know that he doesn’t have the world’s most epic lunchbox. I did a good job.